It was such a pleasure hearing Lolis Eric Elie speak at JLR's Book & Author Event last week. All of the authors who spoke were wonderful, and it was fantastic hearing them all speak so eloquently about their books, and other subject matters (especially Jen Lancaster, who had me in stitches telling her story about going from a dot-com CEO to being broke, and how she found her way out). But it was especially interesting listening to Elie speak about New Orleans, and about food. Reading his words is one thing - you can get a sense of his passion, but hearing him talk was truly inspiring. I got to meet him briefly afterwards, and he signed my copy of "Treme: Stories and Recipes from the Heart of New Orleans." I think we talked a little about food blogging, but I honestly can't remember. I tend to get a little light-headed and palm-sweaty when talking to people who are famous. I was also cognizant of the lady in line behind me who said snidely of the woman in front of me having her book signed, "Oh great, she's telling him her life story!" Regardless, I was thrilled that I could attend the event, and even more thrilled that Elie's speech inspired more people to buy his wonderful book. 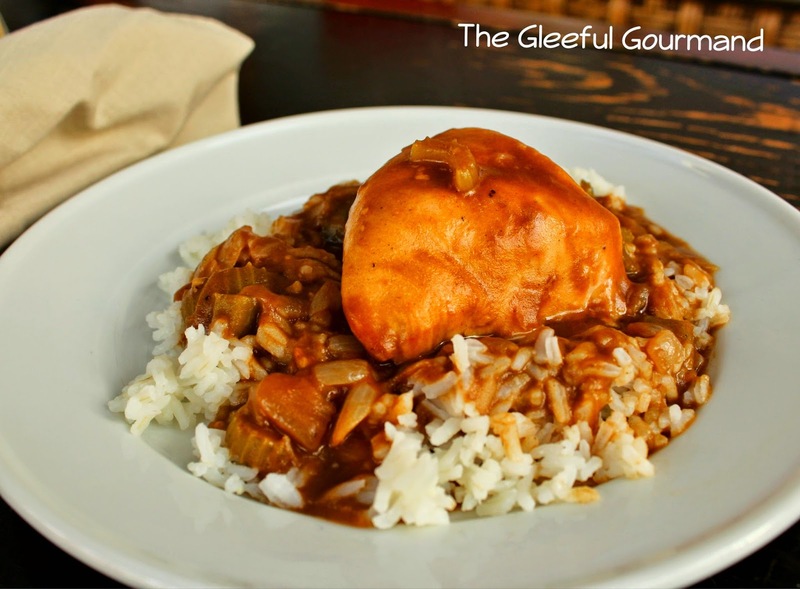 In that vein, I have one more take on a recipe I was very eager to try out in the book: Chicken Étouffée (eh-two-fay). I have always loved étouffée - especially my husband's shrimp étouffée. It's the kind of dish that is comforting, but also has several levels of flavor and depth so that when you get to the last bite, you're profoundly sorry that you've finished. The character in the book who "makes" this étouffée is a single Dad cop, and his section relates that "Étouffée means 'smother' in French. In a real New Orleans restaurant, you might see either term, but a tourist trap would never have smothered chicken on its menu. It doesn't sound exotic enough. By either name, it's a standard Louisiana cooking technique." A mess of Mise En Place. The actual recipe is from noted New Orleans chef Poppy Tooker, and seemed incredibly easy, and uncomplicated, unlike the shrimp étouffée we've made. 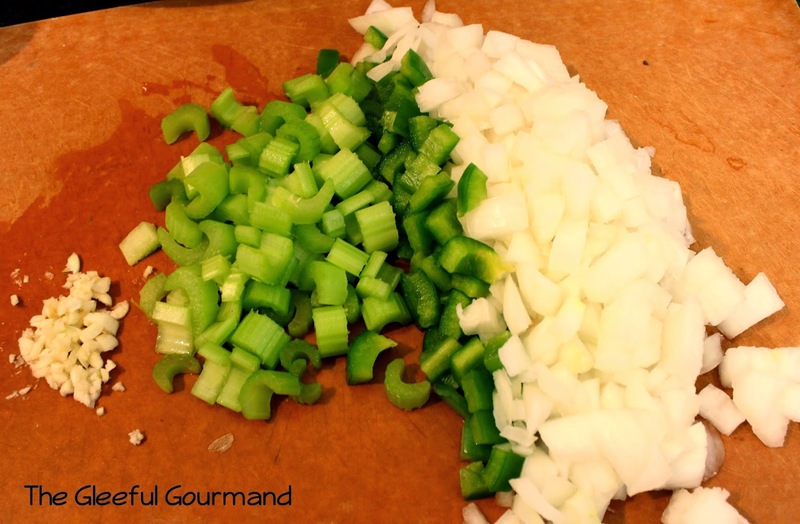 It starts out much the same with making a roux, and a base of sautéed onions, celery, bell pepper and garlic. But then it deviates into having you use beer for the liquid (it also suggests chicken stock if you don't want to use beer), and 6 boneless skinless chicken breast halves just thrown in the pot and simmered with all the spices until tender. As always, it's served over hot rice. The first problem I ran into was that I had no fresh thyme - and thyme is essential to any good étouffée. I tried to substitute ground thyme, only using half of what they called for, but I guess I still overestimated how powerful the dried herb would be, because the thyme flavor completely overwhelmed the flavor of the dish. Whoops. The second thing I found disheartening was how, underneath all the thyme, there was a basic lack of flavor. Even with all the beer (it calls for 1 bottle, and says you may have to open a second, I used 2 1/2 because somehow it still managed to cook way down) and herbs, it still came out very lackluster. The good news is, I know how to fix it. Nothing is done to the chicken breasts save for simmering them in the sauce, and I believe that's a crucial misstep. It makes it easy, sure, but it also leaves it bland. My suggestion is to salt and pepper the chicken breasts, and then in a separate pan with about a tablespoon of vegetable oil, over medium-high heat, sear them until just golden brown. That will bring in lots of flavor. Better yet, get some chicken thighs with the skin on, and bone-in. That would also do the trick. I would also forgo the beer in favor of chicken stock for rich flavor, or maybe alternate the two. The last thing I would recommend is 1 Tbsp. (or more) of tomato paste. The sauce needs that extra layer of depth and flavor giving it zing, even before you dash on some hot sauce. As I mentioned, this recipe comes from Chef Poppy Tooker, but I have modified it to my own tastes. • Salt and pepper chicken breasts on both sides, and cut in half. • In a skillet, heat 1 Tbsp. of vegetable oil over medium-high heat until it just begins to shimmer. Place 3 chicken breast halves in the pan and sear until golden brown, about 3 minutes on both side, removing when done. Add remaining oil and chicken breasts, repeating the process. Set chicken aside. • In a deep cast-iron skillet or Dutch oven, heat the bacon fat or olive oil over medium heat. When the fat is hot, add the flour slowly, 1 tablespoon at a time, stirring constantly to help it dissolve and incorporate. When all the flour has been added, continue cooking the roux, stirring constantly until it takes on a rich dark brown color - about 7 minutes. • Add the onion and cook, still stirring constantly until it softens and the onions darken, about 3 minutes. Add the celery, bell pepper, and garlic and cook until the vegetables are tender, about 5 minutes longer. • Whisk the bottle of beer into the pan, stirring to incorporate. Stir in the thyme and bay leaf. Bring to a brisk simmer and cook for 10 minutes. At this point, if your liquid is running low, start adding the chicken stock. At the end of the 10 minutes, add the tomato paste, stirring again to incorporate, then add the chicken. • Reduce the heat to a low simmer, cover tightly, and cook until the chicken is just done, about 20 minutes (this is where you can start making the rice). You may have to add more liquid as the chicken cooks. When the chicken is done, season with hot sauce, and salt and pepper to taste. 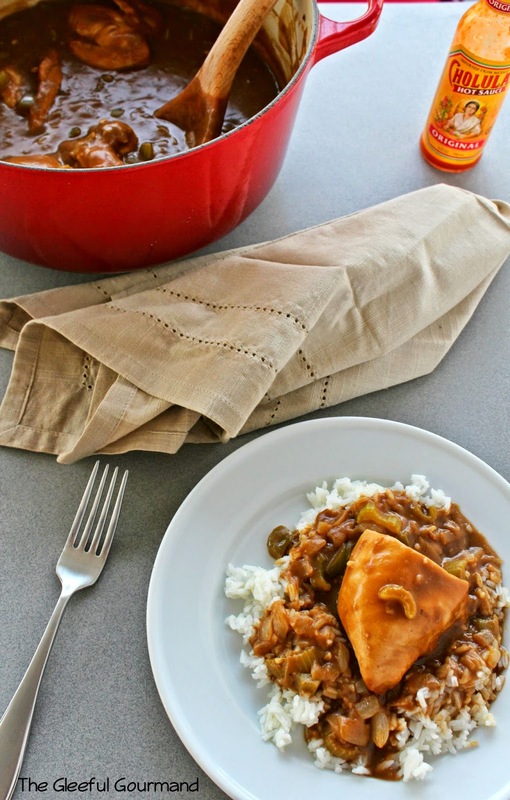 • Scoop the rice into individual bowls or plates and spoon the étouffée over it. Serve immediately.